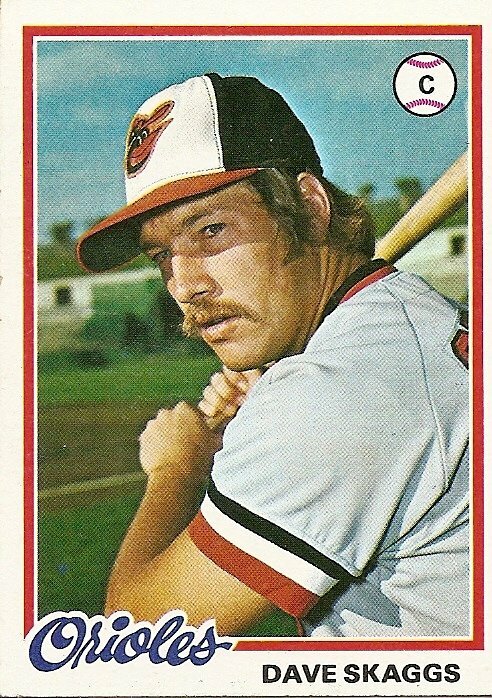 He hadn’t played in the major leagues for ten years, since 1980 when he appeared in two games for the Baltimore Orioles and 24 games for the California Angels. I don’t know if he played in the minor leagues after that, because baseball cards only show the minor leagues as a prelude, never as an aftermath. The fact that Skaggs was available to limp around for meager pay in a doomed geezer winter league suggests that he probably didn’t instantly leap from his 1981 release by the Seattle Mariners (who had signed him a month earlier but didn’t need him because they already had Terry Bulling) to a spectacularly successful career in some other field. He probably kept playing ball. Perhaps he even stuck around long enough to gradually make his way back down the minor league ladder he’d spent several hard years climbing. Back to Rochester, where he’d toiled in 1976 and part of 1975. Back to Asheville, where he’d toiled in 1974 and part of 1975. Back even earlier and lower, to the team he played for in 1973, five years into his professional career and still a million miles from the majors. I was trying to walk to the youth hostel. I took a wrong turn and walked two miles in a nowhere direction. The road was flat and cracked and stretched into afternoon hazy visions of steel industrial plants, the smokestacks breathing streaks of dirt into the sky. The cars that passed were mostly broken down Russian cars with no catalytic converters, so their foul air was noisily blasted in my face until I was light-headed and achy and felt enclosed. The pack was heavy and beginning to dig down into my shoulders. The landscape was gray and barren. Earlier I had walked past a huge Russian Army barracks, a truck of dark-eyed soldiers passing me into its entrance. Soon they would all abandon the hulking stone buildings to go back to their country to starve. I was walking on the road and thinking not only of my own nowhere going but the whole earth wrapped as it is in cracked, nowhere going roads and abandoned useless buildings and towers and potatoes falling and rotting to the ground as millions starve in muddy hovels in the cold. This was the black end. I was saying to myself, “I will go home, I must go home,” and as I said it I thought of the massive half-realized failure of my own life and how I couldn’t speak to anyone ever from shame and how I would lead a mundane, death-surrounded life and never really know home. You are currently browsing the archives for the Dave Skaggs category.